January 2013 appears to be shaping up to be a more normal winter, biting wind, J swirling around with fine snowflakes, eddying into all the nooks and crannies the barns and hoop houses have to offer. Temperatures have remained below freezing for more than a day or two. Really, it is not as bad as winter conditions go for zone 6b. The pair of local bald eagles still return to their summer roost, enjoying the open creek and isolation of the open pasture. All things have settled in. So, until the sun rises a little higher in the sky, the major task at hand is pruning at Brick House Nursery. Having started our field growing in the spring of 2011, there are about 20 acres of plants to care for. The time of rest in the growing world affords us a more relaxed schedule, which gets less relaxed as the acreage and tree sizes increase. Though some form of pruning is a year round endeavor, the winter pruning affords us the more critical time as the structural development of the trees takes shape. Without the summer foliage, the obvious corrections can be achieved with greater precision. Crotch angles, proper branch spacing, crossing branches, subordination of branches are the check list one follows through as it greets each specimen in the long row. Not all corrections can be accomplished in one attempt. The yearly task is supplemented with some summer visits to develop the best form and strength of each plant. Experience allows the pruner to react to the different growth patterns and future responses of each species to decide the severity or gentleness of each pruning performance. 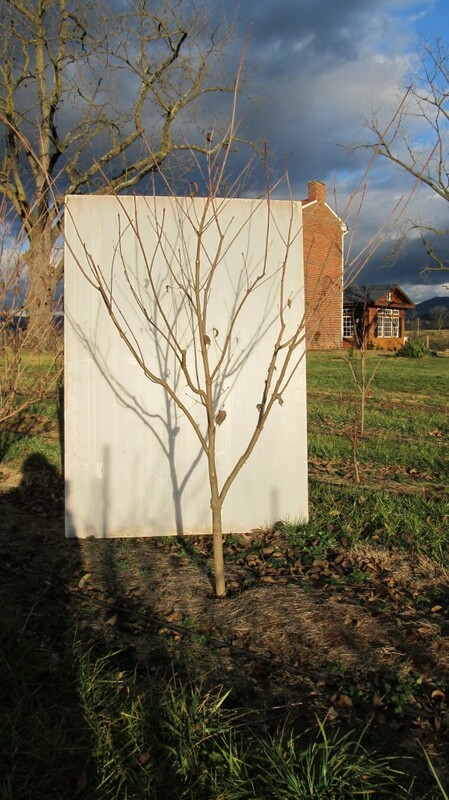 The goal of these activities is to begin the proper structure of a young vigorous shade or flowering tree. The trees are aimed to be selected for specific sites, around patios, homes, pools, gazebos, and other yard structures, so their longevity is critical to fulfilling the expectations of the buyers. 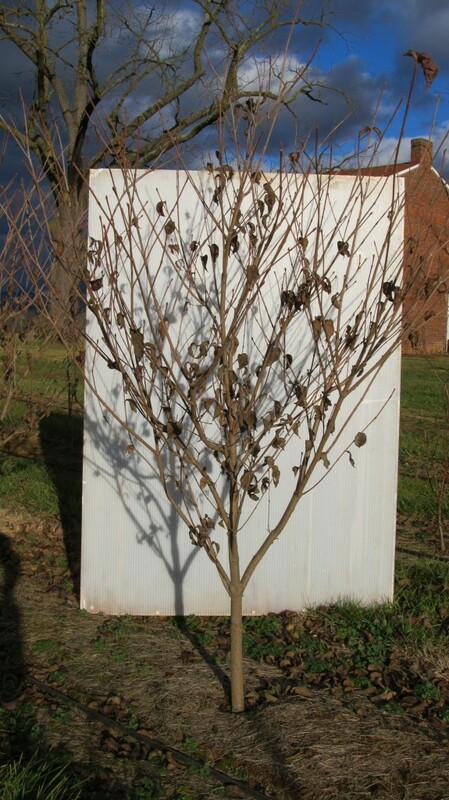 There are many other factors converging on these specimens as they express themselves in the landscape, but we are very aware of the essential nature of early development of shade and flowering trees of all types. We welcome you to visit us, and view for yourselves these important aspects of trees and their future success in the yards of your clients. A before and after of a 2 year Kousa Dogwood. Approximately 1/3 of the branches removed.